Trail Boss tools are integrated on to the rear of this eMTB frame from Specialized. We’re always being asked what’s the best thing you saw at Sea Otter. This year, the nod just might go to this trail building (not taming) eMTB from Specialized. Behold a Turbo Levo with modular Trail Boss building tools integrated into the frame of an e-powered hardtail. No matter your feelings about eMTBs, you gotta admit this is a cool rig. Trail building and maintenance are essential to our sport, but transporting tools to remote areas can be a tough task. By integrating the modular Trail Boss tools into the frame, the trail worker has an easy way to get the area that needs work and is able to work on the trail more efficiently, not burning all their energy slogging tools into the woods. Press play to learn more. 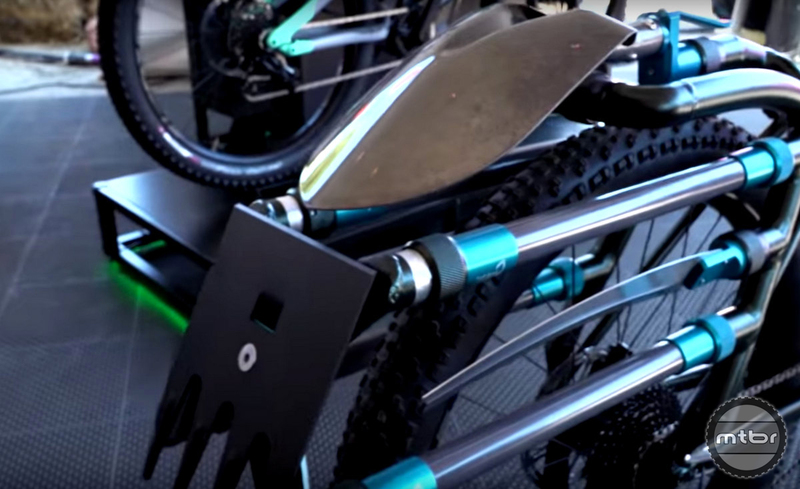 Trail Boss tools are integrated on to the rear of the frame. Is this just a different way for the bike manufactures to get E-bikes on non-motorized trails? I couldn’t agree with you more. Anything assisted beyond your own human muscles is NOT a bicycle. They do not belong on non-motorized trails. I am tired of our world becoming lazier and fatter. I even see kids on motorized scooters, “power wheels”, and that stupid hover boards! What’s this world coming to? I suppose you are also tired of the aging population. A bicycle is human powered, pedal driven. E-bikes are not. The rack and tools are a great system! Does the rack mount to standard mounts? As far as the ebike goes, if its just used by trail crews, its better (less impact) than the tractors, motorcycles, and quads that they use now. Great integration. I’d use it. I’m new to this whole e-bike dislike — the argument against electric bikes is that anything which assists the rider’s muscles is not the definition of a bicycle? I think that’s true enough, but I don’t see it as a demerit, just a distinction. After all, if the line is “assists the muscle” then you’d have to go to a single speeds fixed gear bike because gears and freewheel hubs just help the muscles. What’s the problem with electric bikes on singletrack or any “non-motorized” trail? I’m looking to update my 90’s Trek Y-bike and the things I note about electric bikes are pretty straightforward: expensive, heavy, noisy. All of which impact only the rider and even the more expensive e-bikes aren’t more expensive than the exotic conventional bikes. The differences are: faster uphill and the same rider can go further. I don’t think there’s any argument that an electric bike is faster downhill, and they’re not more dangerous or do more damage than conventional bikes. So what’s the cause of e-bike dislike?